I first met Amy online. She found my website while she was searching for things to do in San Antonio with her boyfriend, Bryan. 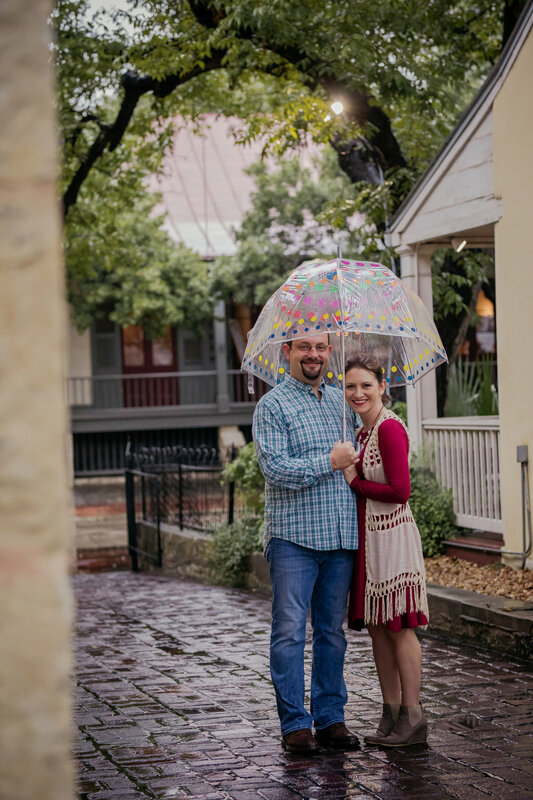 They both live in Kentucky and planned a weekend getaway in the Alamo city. The first thing that got my attention was the fact that they live in a town not too far from where my family spent 3 years of my childhood. My dad is a government contractor and so for a few years during my teen years, we traveled a bit while my dad built things like prisons and courthouses. And of all the photographers in San Antonio, she found my website and we were essentially neighbors in the early 2000’s. I love when the universe does little things like that. Anyway, we planned to meet downtown-not far from where they were staying. La Villita seemed like the perfect spot, full of history and colors, and easily accessible for out-of-town visitors. As so often happens here, in South Texas, the weather report was inaccurate and we met up under the cover of umbrellas. That didn’t deter Amy and Bryan one bit! We spent the rest of their session chatting, laughing, and dancing our way from covered area to covered area, and then finally said- forget it! We put the umbrellas aside and the two of them danced in the rain.